Sometimes in athletics, everything comes down to the perfect angle. The angle of release. The angle of impact. The angle of pursuit on an escaping running back. The angle of light. 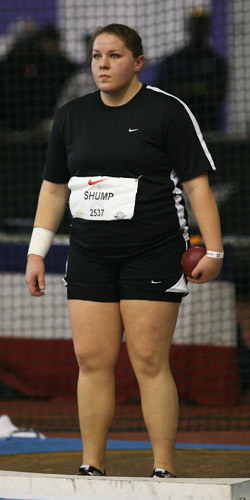 For Pennsylvania shot putter Karen Shump, the difference between winning and losing the 2008 Nike Indoor National championship came down to the angle between her right shoulder and her right hip. Shump, after conducting a long-distance game of one-upmanship with fellow shot putter Becky O’Brien all winter, finally had the chance to confront her challenger face to face in the Landover MD throwing ring. The two seniors had traded the US lead in the shot put back and forth throughout the season, without ever participating in the same competition. One of them would hold the top national mark for a few days, and then lose it by inches. In one case the exchange took place over the course of hours. Each young woman kept tabs on the other, taking wincing glances at the internet lists, hoping to hold the lead another week, letting the disappointment at having it slip away fuel the fire for another day of practice. Becky, in Maine, perfecting her form against an imaginary Karen. Karen, in Pennsylvania, unleashing Becky-beating throws in an otherwise empty ring. Two athletes at the top of their game, competing against ghosts. They’d met before in previous Nike national meets, but always in the long shadow of Kamorean Hayes—the dominant girls’ shot putter the last few years—and never with both of them performing at this level. But on Sunday morning, with O’Brien installed at US#1 after her 50-11 at the USATF Indoor Championships on February 24th, and Shump at #2 after a 50-07.50 toss at the PTFCA Track Carnival two weeks earlier, they stepped to the same ring for the first time this year. A perfect storm in a narrow circle. Shot putters—and throwers in general—have traditionally languished in the hinterlands of the track and field landscape, consigned during competition to low-attendance hours, outside fields, dank auxiliary gyms and off-site locations. But in the past few years, behind the crowd-pleasing antics of weightmen like Adam Nelson, Christian Cantwell and Reese Hoffa, the shot put in particular has begun to take center stage at more and more meets. When presented properly, it turns out, the audience will embrace the concept of screaming athletes launching heavy objects as far as possible. Strong rivalries only serve to up the ante, and the one between Shump and O’Brien had been building all season. Fans who normally would’ve taken a hotdog break during the girls’ shot put had their eyes firmly trained on the action between the nets. And the two protagonists didn’t disappoint. 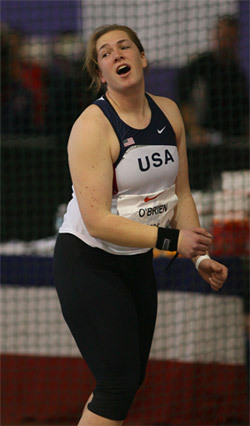 O’Brien opened with a stunner, channeling months of distant competition into a six-inch PR of 51-05 which instantly became the new US#1 and seemed capable of ending the match before it had even begun. Shump would need nearly a one-foot personal best to surpass O’Brien’s initial heave. Was it possible that O’Brien had swiped the title from Shump’s grasp before Shump had even had a chance to stalk the ring? O’Brien, for one, wasn’t buying it. Shump responded with a strong series in the preliminary round, including a 50-4 toss announcing that she too was ready to compete in the rarified air of 50 feet, but the advantage still lay with O’Brien heading into the final. That’s when the already-focused Shump gave the ratchet one more turn, bearing down on the thing that got her here in the first place: technique. Neither improved on their first throw of the finals, connecting with attention-grabbing jabs more than knockout punches. Shump, however, had a roundhouse ready for her second effort. Stepping into the circle and shouldering the shot against her chalk-dusted neck, Shump steadied herself, momentarily froze, and then exploded through a series of positions which are by now more ingrained than memorized. Whipping her right arm across her body with alarming ferocity, she unfurled a gravity-defying bomb which begrudgingly returned to earth out beyond the 50-foot arc painted on the sector. Fifty-two feet and four inches was the mark. Judging from her demeanor, you would have though she threw it five. There was no jumping, no celebrating, no joyous high-fives or fist-pumping sprints around the far turn of the track. She watched the shot land, nodded, and marched out the back of the ring. When the official measurement was announced, she stared straight ahead and began pacing the sidelines. Conceding no emotion. Knowing this thing was far from over. Did her heart sink, even a little, when she saw the ball land nearly a foot past her new personal best? O’Brien was having a great series, and that continued with a 49-0 on her next-to-last effort, but she still couldn’t match Shump’s monster heave. When Shump took the ring for her final toss she reached 51-8, giving her two throws better than the 51-5 O’Brien managed in the opener. Now O’Brien was down to her final throw. Taking the circle to the rhythmic clapping of supporters wedged along the retaining fence across the track, O’Brien paused to bless herself, drew a sightline along her outstretched right arm, lowered her arm, turned her back on the sector, and prepared for perhaps the biggest throw of her young career. When she ripped off the attempt, she chased it into the arena air with a guttural, primordial yell which echoed through the fieldhouse. Willing the shot to go far enough to make a difference. It came down forty-nine feet and seven inches later. Finally, Shump could celebrate. Finally the high fives, the back slaps, the hugs and the handshakes. On the other side of the track her personal coach, Barry Swanson, was hoarse and beaming. How would he explain the breakthrough of that 52-footer? The difference that elevated that shot into the stratosphere? Worked on every time she throws. An angle that, among many other things, made the difference for Karen Shump on Sunday. An angle that is something more ingrained than memorized at this point, and one which finally clicked at the moment it mattered the most. “That was her best throw technically, without a doubt,” Coach Swanson said. And the feeling of competing against O'Brien, with so many eyes watching? Two girls, both over fifty feet, and an outdoor season yet to come. Imagine what might happen if all the angles align.